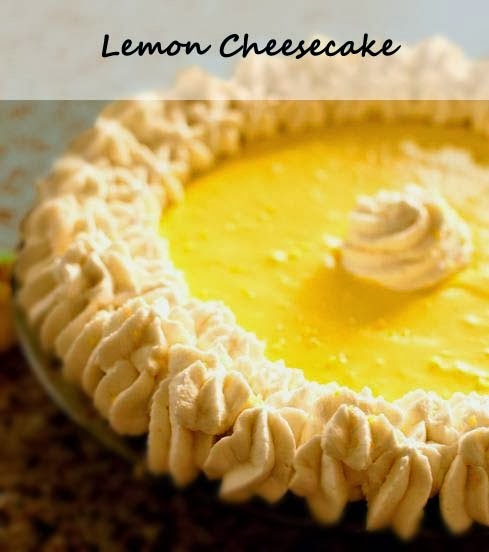 If you love all kinds of cheesecakes, be sure to leave room for this tarty lemon cheesecake. It's quite easy to make. In a food processor, pulse graham cracker pieces and lemon zest until cracker pieces are fine like a powder. Transfer to a mixing bowl. Melt stick of butter and add to bowl with graham cracker crust mixture. Make sure all butter is added into the crust so the consistency is like moist sand. Transfer crumb/butter mixture to pie tin and press against the bottom and the slanted edge of the pie tin. Bake crust for 10 minutes at 350 deg F, or until slightly browned. Remove and set aside to cool. In a mixing bowl, cream together softened bar of cream cheese and granulated sugar. Add heavy cream and continue to mix until smooth. Be sure to scrape the edges of the bowl while mixing. Add in lemon juice, gelatin melted with hot water, lemon extract, and food coloring, and beat it all in. Pause to taste sweetness. If too tart, add more sugar. If not tart enough, add more lemon juice. Once you are satisfied with the taste, use a rubber spatula and spoon mixture into the cooled pie crust. Place in fridge for 5-8 hours to firm up. Beat all ingredients together in a bowl until fully mixed. Use a piping bag with a star tip to decorate around the cheesecake. Enjoy! For another fruity flavored cheesecake, see the recipe for raspberry cheesecake.